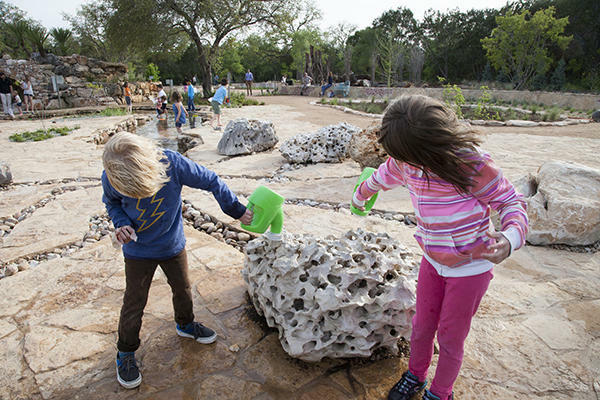 From mazes made from native shrubs and giant "birds&apos; nests" comprised of native grape vines, to tree stumps perfect for climbing and even a grotto with caves and a waterfall, the 4.5-acre Luci and Ian Family Garden at Lady Bird Johnson Wildflower Center is the perfect place to let kids run off steam and enjoy nature. Fall is one of the best times of the year to visit the Wildflower Center thanks to the beautiful blooming flowers and a slew of fun events. Children playing at the Wildflower Center. Courtesy of Jessica Pages. The Wildflower Center displays 650 native Texas plant species in gardens, meadows and nature trails but it&apos;s the Family Garden, which opened in May 2014, that&apos;s been a big draw over the last year. Attracting a new group of visitors who might not have previously visited the Wildflower Center, many folks have even opted to become members. Best of all, the family garden encourages free outdoor play, something that&apos;s getting harder to come by. Designed with the kids of all ages in mind, children are allowed to run around, touch the plants and explore nature in whatever way they wish at the Family Garden, which provides more than a dozen interactive and educational features. Kids can follow dinosaur tracks to Dinosaur Creek, where they can splash in the water with their hands and feet. Next, families will love exploring the Texas-inspired pictographs adorning the cave walls in the Hill Country Grotto. Kids can climb, crawl, hide and hang on a series of stumps at the Stumpery. Fun fact: A dead standing tree is called a "snag," which plenty of critters like squirrels and raccoons often call home. It&apos;s the "Nature Build" section of the garden, brimming with branches, twigs, rocks and more that is one of the most popular, as budding engineers love to build forts and structures. Bug Night Out, slated for 6 to 9 p.m. Oct. 2 this year, drew more than 600 folks last year. Bring a flashlight and enjoy a rare look at the gardens at night during this family-friendly and educational event. Take a guided flashlight tour, or explore on your own but be sure to stop by the mercury light stations, which attract some pretty cool insects. The Fall Native Plant Sale, set for 9 a.m. to 5 p.m. Oct. 10 and 11 (Oct. 9 is open to members only), is one of two plant sales a year at the Wildflower Center. Score rare native plants for your home garden or take a garden tour and learn from the experts. Celebrate Texas Native Plant Week, Oct. 18-24. Along with being beautiful, native plants help conserve water, provide habitat for birds and butterflies, and protect the soil. Most of all, native plants provide the genetic diversity needed for balanced ecosystems. Lady Bird Johnson Wildflower Center, 4801 La Crosse Ave., is open Tuesday-Sunday from 9 a.m. to 5 p.m. Visit www.wildflower.org to learn more.